As the “Foodie Generation” (62% of Millennials consider themselves to be foodies), Millennials are much more selective about the foods they buy, and they’re more willing than older generations to pay a premium for higher-quality foods made with healthier ingredients. According a recent report by Mintel, only half of Millennials find it important to make food purchases that fit inside their budgets, compared to 61% of non-Millennials. 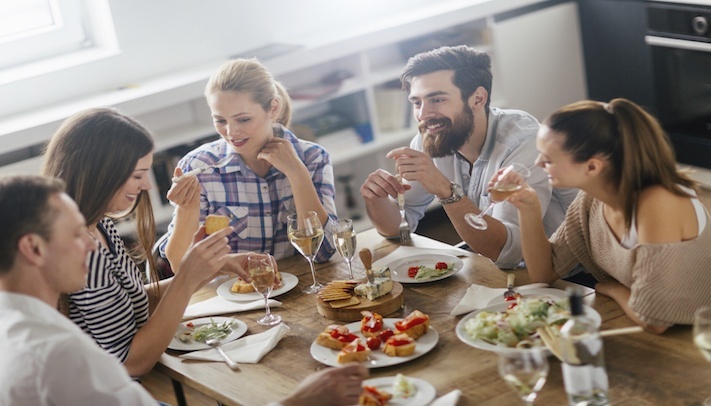 Whether they see a new natural product at the store that looks interesting, or an exotic appetizer at a restaurant catches their eye, Millennials are prone to making small, spontaneous food purchases that won’t break the bank. They’ve fully embraced the “you only live once” attitude, and one way that they live life to the fullest is by exploring and experiencing new foods, and eating right in order to maintain good health. To Millennials, these values are priceless, and they certainly believe it’s worth spending a little extra in order to feel happy and healthy when eating. That being said, with Millennials falling between ages of the 19 to 35 in 2016, a large portion of the generation are still students or recent college grads in entry level positions. They don’t quite have their financial footing yet like older generations do, and they’re still paying off their student loans, while simultaneously juggling the expenses of starting a family. Because of this, most Millennials are operating on fairly tight budgets, and they’ll always take advantage of a good deal if it presents itself. If there aren’t any deals available, you can be sure that they’ll be looking for products that offer the most bang-for-your-buck value when it comes to taste, quality, and nutrition. In order to win over this large and powerful demographic, some companies are going as far as creating entire grocery store chains targeting Millennial consumers, but thankfully, there are much easier ways to win over this hard-to-reach audience. As a matter of fact, one “whey” is by using natural whey protein ingredients like Grande Bravo® and Grande Primo™ to lower your food costs, while also introducing a healthy protein alternative that meets Millennials’ desire to try something new, healthy, and unique. Grande Primo™ dried yogurt and cultured dairy products can be used to provide the authentic creamy taste and texture of fresh yogurt, without the shelf-life, handling, or cost issues typically associated with it. In fact, our Y100 formulation even meets the Code of Federal Regulations (CFR) for lowfat yogurt prior to drying. 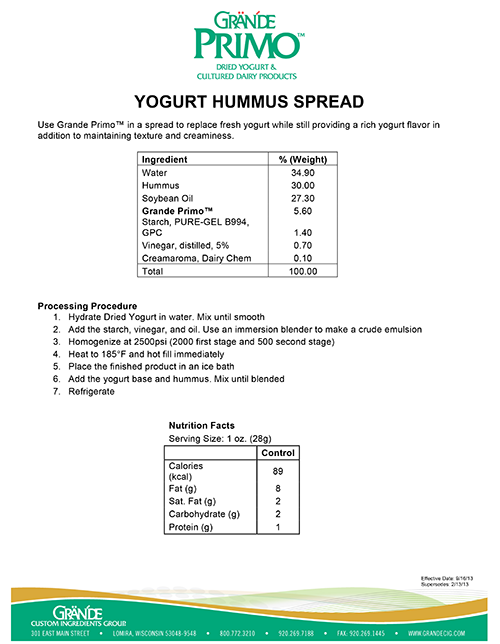 It’s perfect for dips, dressings, smoothies, snack bar coatings, and it can even be used to create a tasty low-fat yogurt hummus dip (see below). Grande Bravo® functional whey protein can also be used to the lighten up the cost and calories of several different applications, like sauces, fillings, spreads, dressings, and frozen desserts—including an avocado lime cheesecake filling that foodies will go crazy for. Its superior water-holding capabilities make it easy for food manufacturers to maintain a rich, creamy texture, all while lowering ingredient costs by replacing high-fat, high-cost ingredients like cream, butter, eggs, and cream cheese. To find out more about how whey protein can help you create interesting new products like a yogurt hummus dip or avocado lime cheesecake, check out the recipes above, and make sure you download our Spinach & Artichoke Case Study for an even closer look at how Grande Bravo® can help you appeal to cost-conscious Millennial foodies.